Just got back from the Bay Area the other day. One of my friends of nearly 20 years just got married. Congratulations to Sam and Becky! And congratulations to ME for getting to try TWO burger joints while on my trip!! When I initially found out that I’d be traveling to the San Francisco/Oakland area, I started reading up on potential burger exploits. Some of the joints that made the first cut included Roam Artisan Burgers, Umami Burger, Super Duper, Rico’s Diner and TrueBurger (I considered In-N-Out, but I’m waiting til they open here in Round Rock :)). I would have loved to have eaten at all these places, but with only 2 meals available for eating out…the numbers just didn’t add up in my favor. With a whole day to ourselves, the wife and I headed out to Berkeley to walk the beautiful campus and just spend some time in the unique little city. As much as I wanted a burger for lunch, I couldn’t deny my wife a healthy hippie meal, especially being in Berkeley. And as a reward, the wife bought me a slider from Phil’s Sliders for dessert. 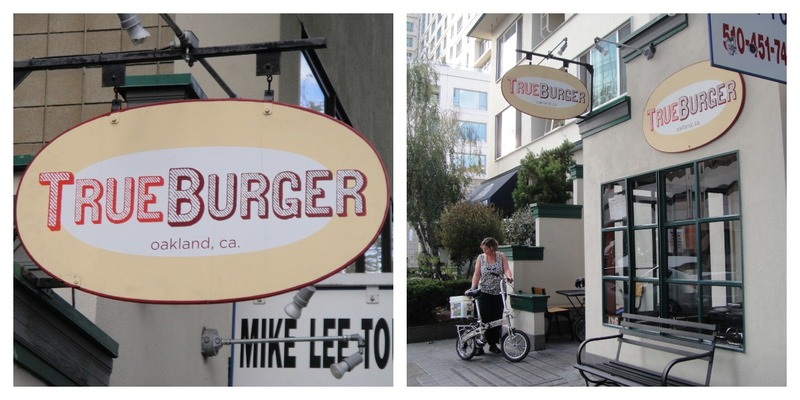 I really didn’t know what to expect as my burger research didn’t include Berkeley. But thanks to a tip from one of my wife’s friends, I got to sink my teeth into one delicious slider (of course, the fact that it was in our direct line of sight from the cafe we were at for lunch didn’t hurt my cause, either). In typical Berkeley fashion, Phil’s is all about organic, homemade/handmade, and environmentally friendly. They use Marin Sun Farms grass-fed beef for their patties and organic potatoes for their homemade potato cubes tots. Not to mention the fact that they use organic dairy for their milkshakes and use homemade syrups for their sodas. Due to time constraints (we only had 12 minutes left on our parking meter), I only had time to devour one of Phil’s sliders, which is probably a good thing since I’m trying to keep my visits to the cardiologist to a minimum ;). 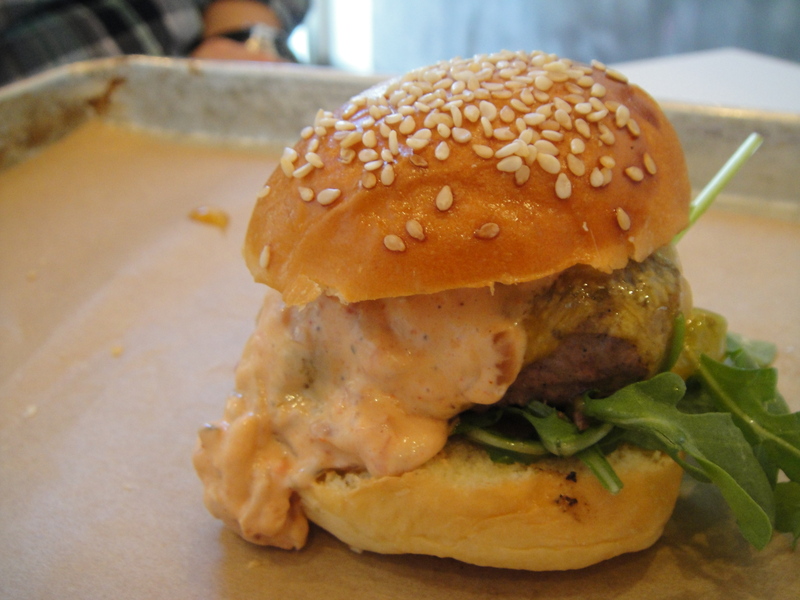 The regular slider consists of a grass-fed beef patty (cooked to a wonderful medium rare), a slice of cheddar, special sauce, organic lettuce (although I swear they put arugula on mine…look at the pic below) on a sesame seed bun. 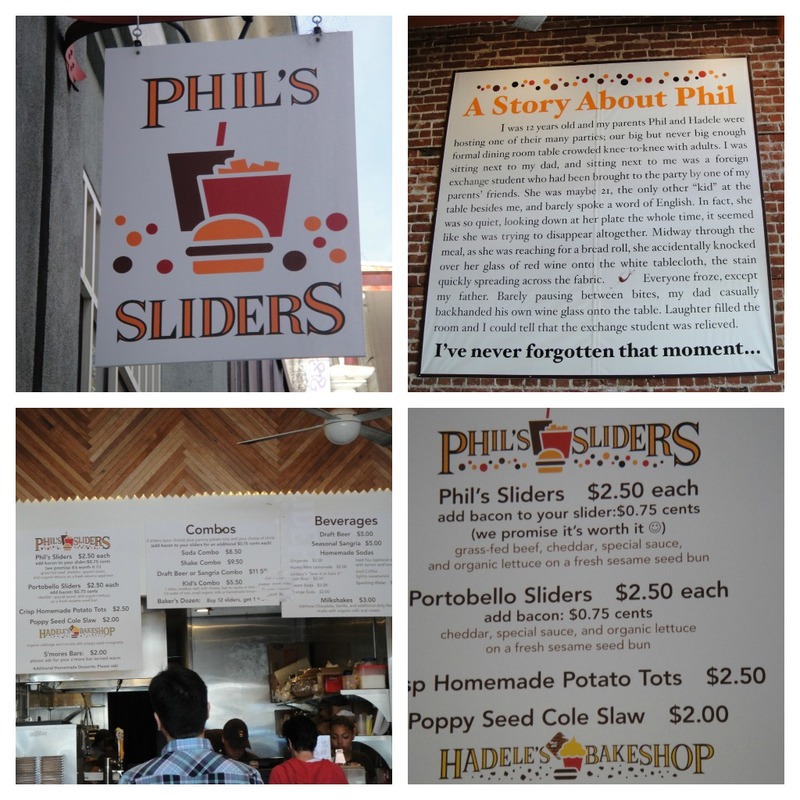 Had I attended Berkeley, I think my grades (and my waistline) would have suffered from too much time spent at Phil’s. After Berkeley, we made our way to Oakland to check into our hotel and relax for a bit. We were gonna eat a local pizza joint for dinner, but due to our inability to get a reservation and not wanting to wait over an hour to eat we headed into town and made our way to TrueBurger, one of the restaurants on my list. Located on the outskirts of Downtown Oakland, the restaurant is sandwiched between a Korean insurance agent’s office and a Korean travel agency…not quite what I was expecting to see. This beautiful bundle came with a 1/4-lb beef patty (cooked to medium), American cheese, lettuce, tomato, and garlic mayo all on a perfectly toasted egg bun. 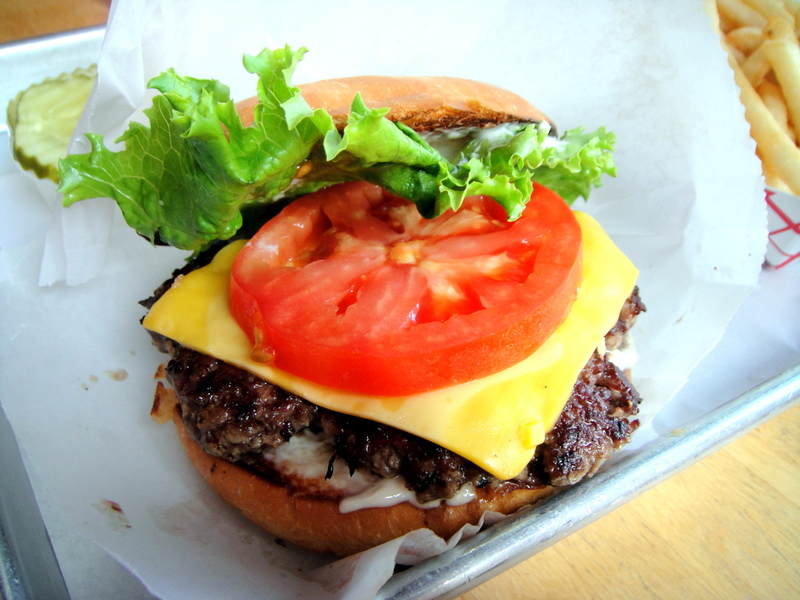 The patty had a nice crust to it, and it was a delight to see the slice of cheese melt over the burger as I ate. I added a couple of pickle slices and some diced onions for even more flavor, but even if I hadn’t, I’m certain this burger wouldn’t have been lacking in taste. 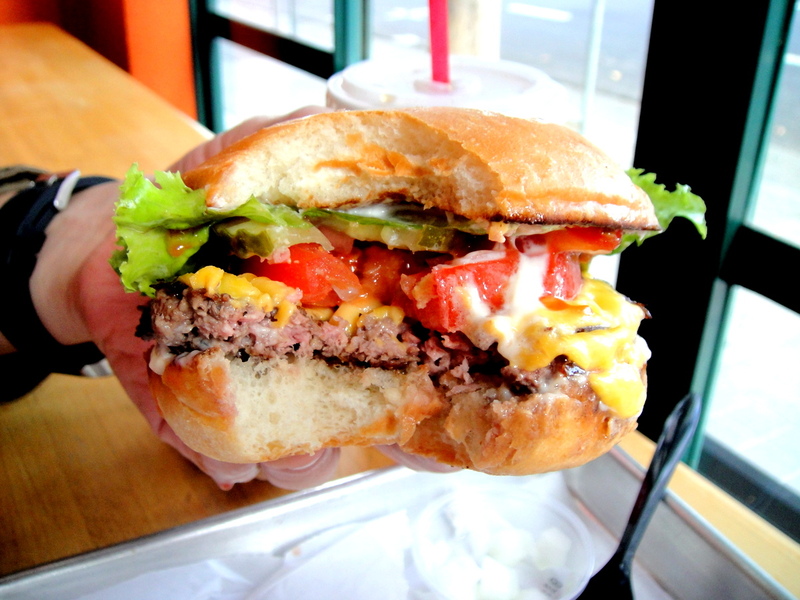 This wasn’t one of those subtle burgers that takes time for the flavors to develop in your mouth. This one grabs you by the collar and slaps you in the face a couple of times – flavor is unmistakably evident in the Cheesy Trueburger. It was clear that the beef had a good amount of fat in it as the burger was a delicious, juicy mess from start to finish. I was particularly mesmerized by their garlic mayo. This tasty condiment really made the burger stand out from all the other burgers I’ve consumed. However, I don’t know if it was because both buns were slathered with the mayo or if the seasoning was a little heavy-handed on the patty (I’m leaning more towards the latter), but the burger did become a little salty over time. I’m sure eating salted fries dipped in ketchup didn’t help much in that department, but thank goodness for free soda refills!! I couldn’t have asked for a better trip…celebrating with friends, spending time with family, and eating new burgers…now that’s the life! I’ve got plenty of burgers to keep me busy here in Texas, but I can’t wait to get back to the Bay.